Visiting Studio M was always going to be a massive day. Up early for a 2 hour drive from Wodonga to Shepparton, we arrived to begin our selections that ran from 9:30am-4pm. 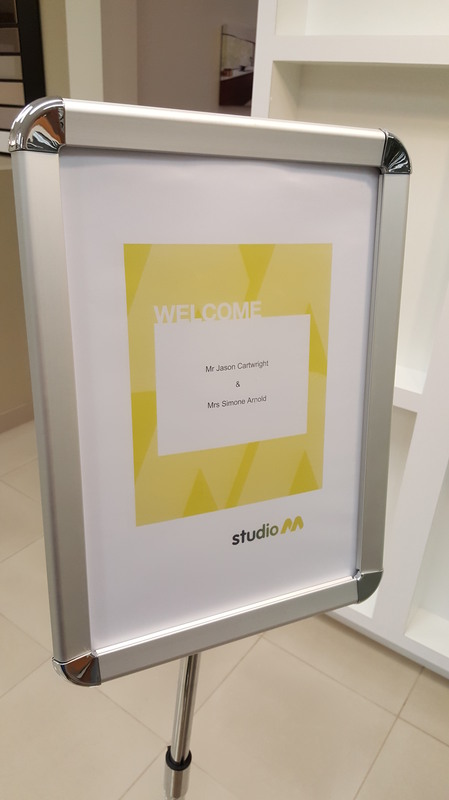 After arriving at Studio M, it was kind of great to see a personalised welcome message. Sure, it cost less than $1 to print it, but really was a nice touch. We were lucky enough to have the run of the place, being the only couple there on the day. 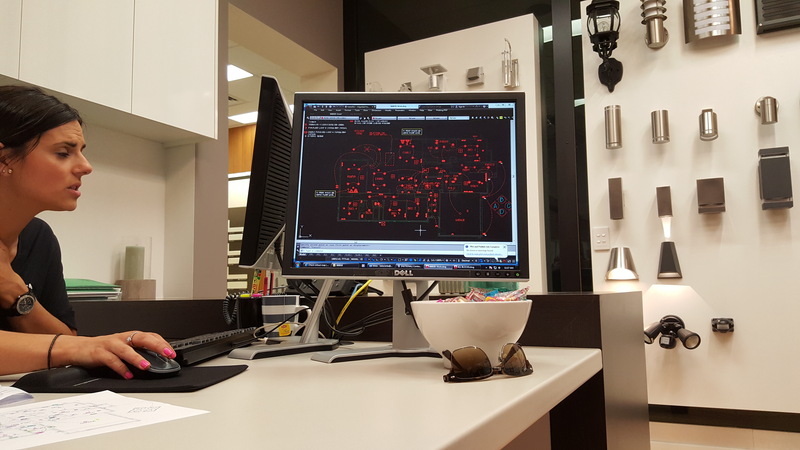 First up was the electrical selections which included powerpoints, NBN, outdoor fan, heat lamps for bathrooms, and of course light types and locations inside and outside the house. Looking for a clean, modern design we were always going for downlights, the question is how many? Many areas needed 4, like the lounge area, dinning area, the kitchen, the rumpus and without trying the number got crazy fast. For those playing at home, we ended up with 45. On the day we selected white LED downlights, with the theory being they would blend in and we would avoid drawing attention to something pretty mundane. Since visitng Studio M, we’ve reconsidered and decided on silver which looks great. The portico gets 1, the alfresco gets 2 (could have gone 4 or more, but tried to keep things to a minimum and we also chose some feature lights on a sensor for the facade, as well as sensor lights for the side of the house and the rear. After electrical came everything else. Starting with the bricks, we settled on Selkirk Ironstone. Then followed by the kitchen, we chose the colour of our 20mm stone benchtop (inc in our Designer home), an undermount sink and fancy kitchen tap. For something we’ll use everyday, we felt this was money well spent . Of course one thing leads to another, so the undermount sink required an extension of the island bench by 100mm to fit the cabinetry necessary. We then looked at floorboards, carpet, cabinetry and splashbacks. For the splashbacks we chose glass splashbacks and while not cheap should look fantastic as we’ve elected to run it through the butlers pantry, giving the appearance that the glass continues through the wall. There was also the garade door, a section, red wood finish (door is actually metal) this will be a great feature of the facade. The rest of the Fortitute Vogue Facade is rendered, but to our surprise our earlier upgrade of that facade, didn’t include the render. Gone was the budget we had allocated for Studio M options, just in that alone. There’s no doubt about it, that unexpected shock certainly cut deep. So committed to that facade (we’d fallen in love with it by then) that we simply had to do it, bricks up front wasn’t going to achieve the modern design I want to walk into everyday and think, this is all worth it. 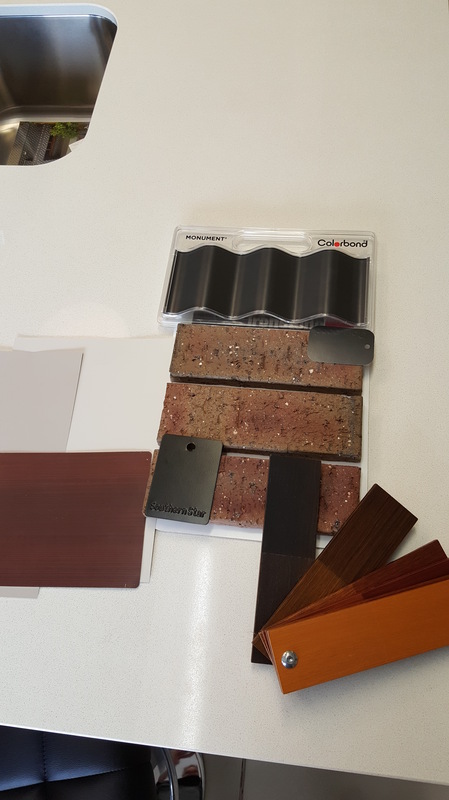 The Colorbond roof, the gutters, fascia, downpipes and window frames will all be in monument, a deep colour that should work well with the Woodland grey fences mandated by the estate. This darkness will be well offset by the large spans of light render. We went back and forward a lot on the colour of the wood stain. Applied to the facade wooden uprights, the top feature paneling, the front door and the bi-folds inside, it was important to get it right. We ended up settling on the darkest render, as to avoid entering the ‘too many things going on’ zone. Below are our selections for the engineered floorboards (left), a representative tile (not final), the dual-roller blind colors (grey and grey), the wall and kitchen cabinetry colors (white), the carpet (right – bedrooms and rumpus), at the very top is the splashback tile, underneath is the stone benchtop and below that is the bathroom vanity colors. At Studio we’d taken a recommendation to go with a black on black look, but since decided on a white top to blend in with the white basins. Studio M was great and insane all at once. The options were simply relentless. With one decision made, the next was fired at us, on so the cycle repeated through the day, with the exception of a much needed lunch break. I seriously respect the efficiency of the process, it was absolutely the fastest way to make so many decisions and we had thought a lot about the choices we’d make prior to the day. Not having to travel to 5 different locations to make the selections was fantastic. Thinking back on the day, there really is no other time in your life where you’ll make so many decisions in a single day. The biggest shocks were the prices for options. Bricks for example went up by each category, we knew that, just didn’t know the bricks we liked were in Cat 6, a $4,500 upgrade. We ended up settling for something in Cat 2, a $500 upgrade. We didn’t just blow past our allocated $5K on electrical and $5K on other options, we came away from Studio M with a very sizable addition to the cost of our house. From what I’ve read from the experiences of others, this was about average. The good news is after running the adjusted numbers, things still work for us financially, so it looks like we’ll end up with an amazing house without compromising too much. There are certainly decisions like not including a water point behind the fridge that we may come to regret, but there won’t be many. As this is our forever home, it is going to cost us to get it right. The experience was great, the staff were friendly and helpful and to watch the lighting designer create our plan on the fly was something I really enjoyed from a technology perspective. I did feel like were were more limited in selection that I had imagined, possible raised expectations from looking through Studio M brochures for the Designer range homes and seeing options that appeared as a choice for us and an inclusion, but at Studio were presented as options that cost extra. Sadly I had to say goodbye to my goal of having square taps everywhere to keep with the modern design. While we won’t be replacing them any time soon, the good news is, that is something that’s changeable in the future, most things aren’t. Our home will be awesome when its done and I wish we could jump in a time machine and walk in the front door tomorrow.